Pour obtenir cette monture, vous devez être exalté auprès de Fossoyeuse. added in 3.2 to even out the number off mounts given per faction, night elves gained Reins of the Striped Dawnsaber. Edit: 3.2 changed all mounts casting speed to 1.5 sec, and deleted the GCD on all mounts exept this one it seams, I don't know if there's any other new one's that's still on the GCD. This will hopefully be changed soon. This is the best screenshot I could get since I am not undead, nor am I exalted with that faction. Thats one SWEET looking skeletal horse. Looks quite....unique. Will, as usual, require non-euneads to be exalted with The Undercity to obtain. Well..i'll be paying Trisfal a visit when this patch goes live! Say it 5 times fast. Nice. This could go well for a bloodelf roleplayer. Note the green eyes, green gem (could be a fel gem), and the red and gold coloring. This is a very disapointing looking mount, like the newly updated Argent mount. Even so, i wont be working too hard for this mount. Is it just me or can anyone else picture Kefka from Final Fantasy III riding this? Just when I planned on getting a raptor on my horde.. This mount certainly has a bit more flair than the other Forsaken horses. I can't help but worry now that new undead players will only choose this one once they gain the epic ground mount ability due to how much this one stands out. This looks like such a beast! I'll be damned if I do not get this, just about the best epic horde mount out there imo. First thing I will do in new patch is buy this. It will make my priest look like a druid! The colors are pretty odd, but kudos to Blizzard for doing something other than a simple recolor. Joseph and the Amazing Technicolor Warhorse? oh thank you god, THANK YOU. for choosing undead for my mage. Am I the only one who dislikes the looks of this mount? Multiple, seemingly random colors (except for the ochre) mixed in every here and there, isn't allways a recipe for success. Please get rid of the red, orange and yellow, and replace it with the same purple shade as the halter. It seems as though you're the minority, but you're not alone. I did purchase this mount but I don't see myself riding it in the future. I would prefer less color also. As they say in graphic design and many other things, Keep it Simple, Stupid. Props to blizzard for releasing this though, more selection never hurts! So where can you get this one? Where I can buy it? Check the 'sold by' tab. this mount belongs on one of those caracel/marry go round things you see at the carnival. What I really like about this is you can actually see the color. The original mounts, including Rivendare's, all look about the same at a glance. Thanks to the Argent Tournament mounts, Blizzard's realized (remembered?) they can apply some pattern work to the skirt, besides flat tones. Now, who do I talk to to get the design they use on the ToC worg armor transferred to the other elite worg mounts? If I could name my mount I'd name this mount Skittles. Yeah, basic color scheme for Hive Fleet Kraken. Watch out! Blizzard used more than 2 colors on a mount! Is there an Alliance version of this? By that I mean an epic mount avaliable in Un'Goro. Added in 3.2, requires exalted with Undercity, must be Horde, and eight gold. I was suprised it wasn't more than 8g since it is soooo cool! 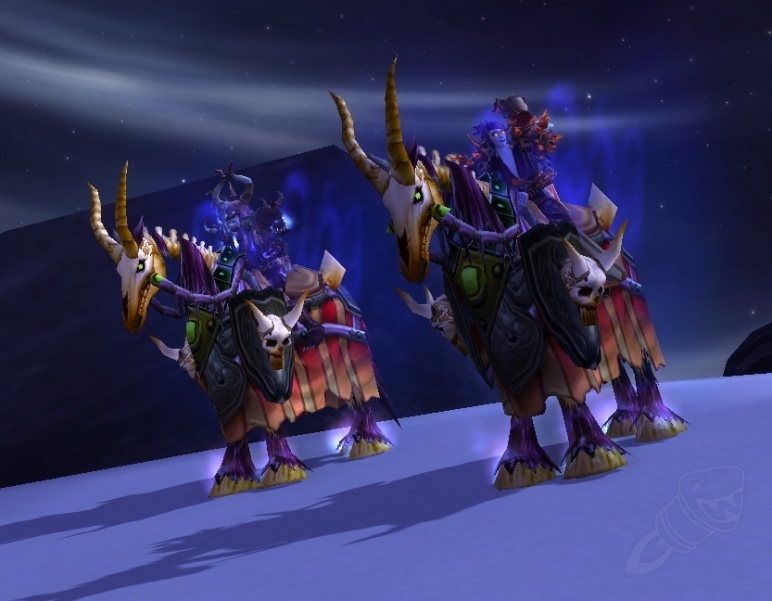 This mount is colourful and looks more festive than your average mount. As well as a instead of my swift gryphon. I always loved the warhorses but all the colors looked the same, you had to look hard to tell one from another. Basically the mount The Joker would ride if he'd become a Forsaken. This horse matches my 264 mage tier very nicely, colors are perfect for it. Ochre... I like that color. It's serious, but calm. War-ridden, but peaceful. Black... but gold. It's 2 great things... all in one. In my opinion, this is the coolest of the warhorses =). Disappointed that the Cheval de guerre squelette rouge is so basic looking compared with this one and yet i had to pay 2000 HP for the red one. For transmogrifiers: looks awesome with the nemesis recolour set. Delvar Poing-de-Fer / Vivianne uses this mount if you want to match! This mount is (just like the White skeletal warhorse from the argent tournament) a lookalike of the mounts used by the Four horsemen in Naxxramas. This one specifically is a a less armored version of Alexandros Mograine, the ashbringer, who used to be one of the four horsemen in the old lvl 60 version of Naxxramas. "Lorsque les héros défunts sont relevés à la non-mort, leurs chevaux le sont avec."